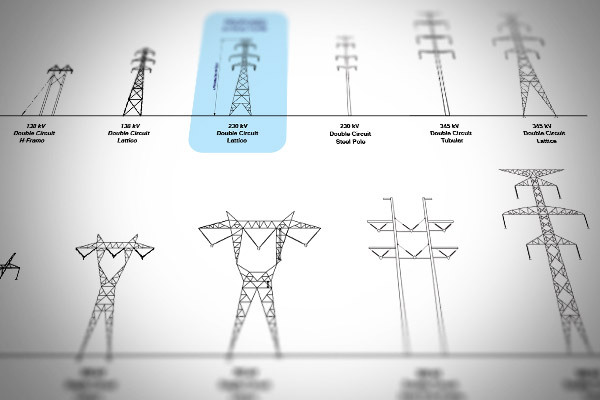 Transource ® is developing the Independence Energy Connection (IEC) project, a new overhead electric transmission project to increase consumer access to more affordable power in the mid-Atlantic region. 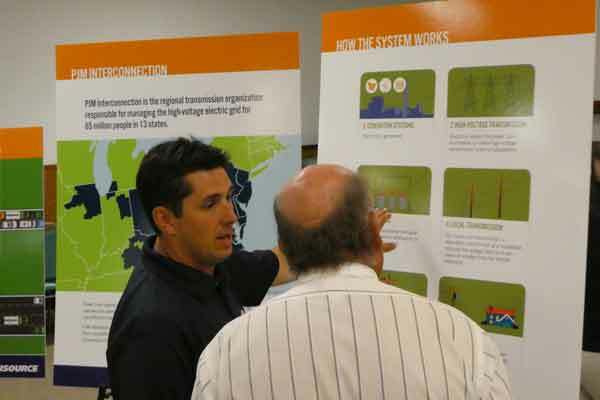 PJM Interconnection, the regional transmission organization, identified concerns with the delivery of electricity into the region and reviewed solution proposals from competitive transmission companies. PJM selected Transource’s solution to address market efficiency issues and awarded construction of the project to the company in August 2016. 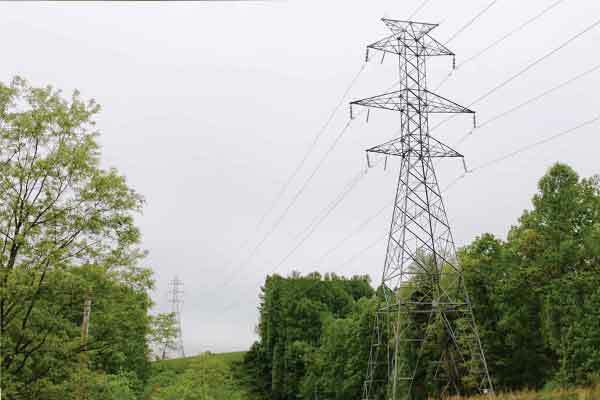 According to PJM, the project will provide $866 million in congestion cost-savings in the first 15 years it is in service and will address reliability concerns for parts of the grid serving customers in Maryland and Pennsylvania. April 27, 2019, 11:00 a.m.
May 18, 2019, 11:00 a.m. Written comments may be filed with the Public Service Commission until Wednesday, May 29, 2019. For more information, visit http://www.psc.state.md.us. 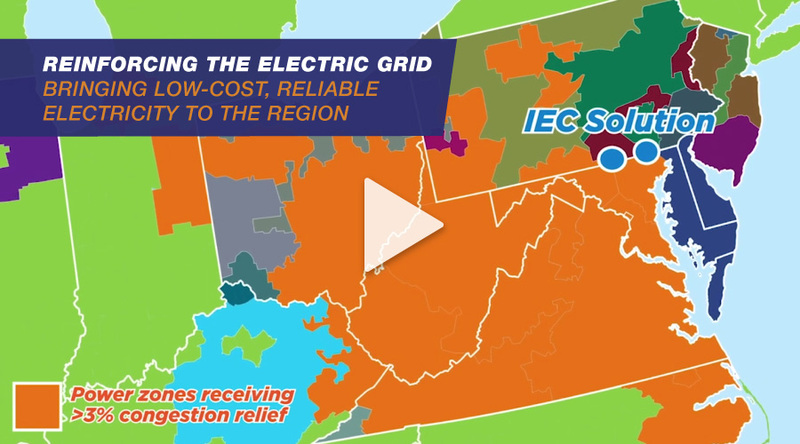 Transource is developing the Independence Energy Connection (IEC) project, a new overhead electric transmission project to increase consumer access to more affordable power in the mid-Atlantic region. 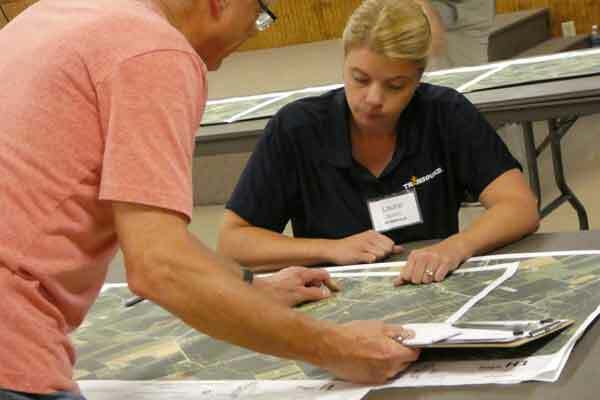 The company worked to balance input with a variety of factors such as existing land use, sensitive species and habitats, soils and topography, historic and cultural resources, and the opportunity to parallel existing infrastructure. 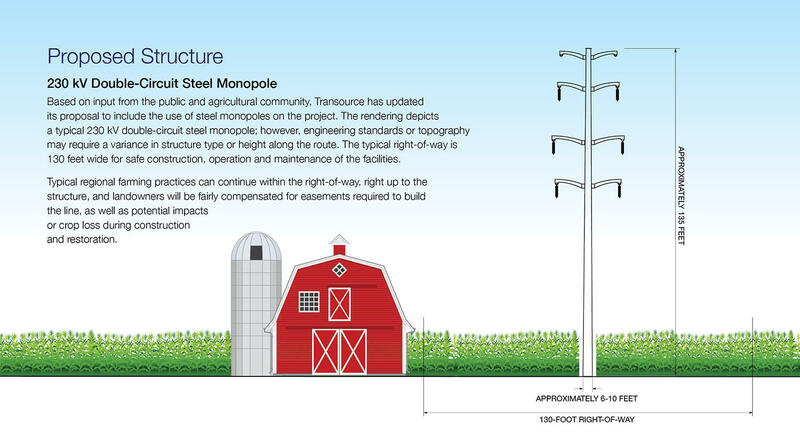 Based on input from the public and agricultural community, Transource updated its proposal to include the use of steel monopoles on the project. 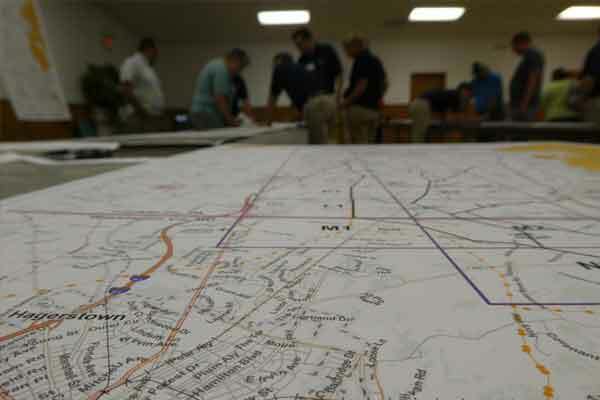 Engineering standards or topography may require a variance in structure type or height along the route. 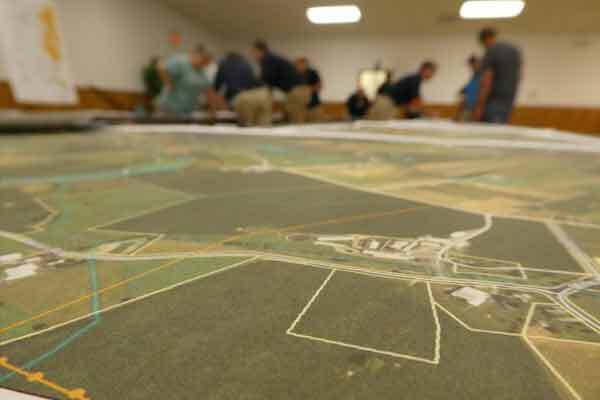 The typical right-of-way is 130 feet wide for safe construction, operation and maintenance of the facilities. 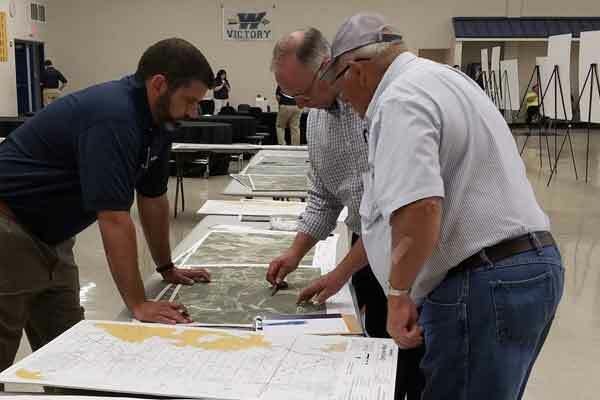 Typical regional farming practices can continue within the right-of-way, right up to the structure, and landowners will be fairly compensated for easements required to build the line, as well as potential impacts or crop loss during construction and restoration. 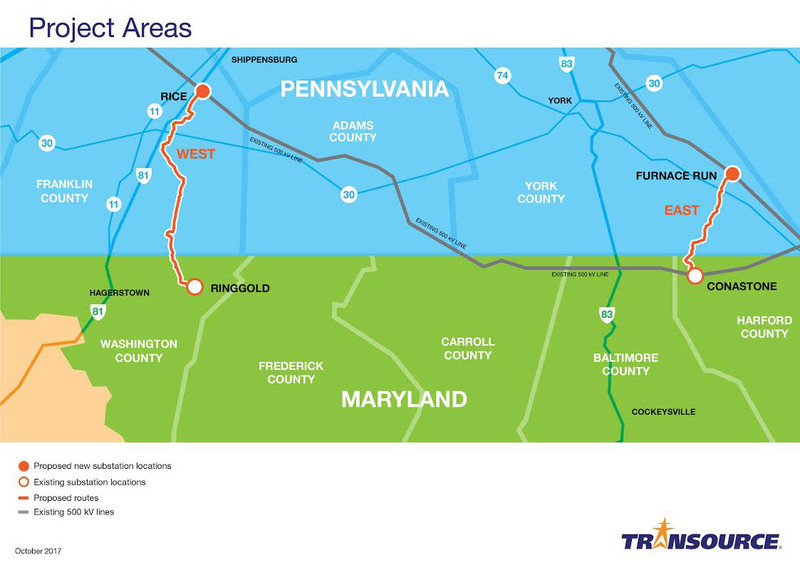 The proposed routes were announced in October 2017 and are part of applications to construct the project filed with the Pennsylvania Public Utility Commission (PUC) and Maryland Public Service Commission (PSC) in December 2017. 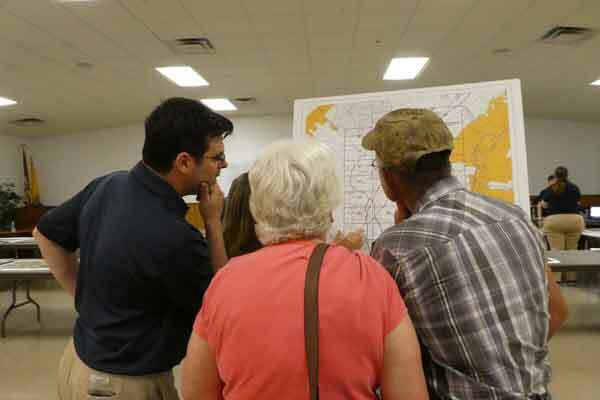 The PUC held local input hearings in Franklin and York Counties in the Summer and Fall of 2018 and evidentiary hearings in February 2019. The PSC input hearings are expected to be held in April and May 2019 with evidentiary hearings scheduled for June 2019. Construction of the IEC is expected to begin in 2019 and is projected to create $40 million in local economic activity. The expected project in-service date is mid-2020. The regulatory process continues to move forward in Pennsylvania and Maryland. 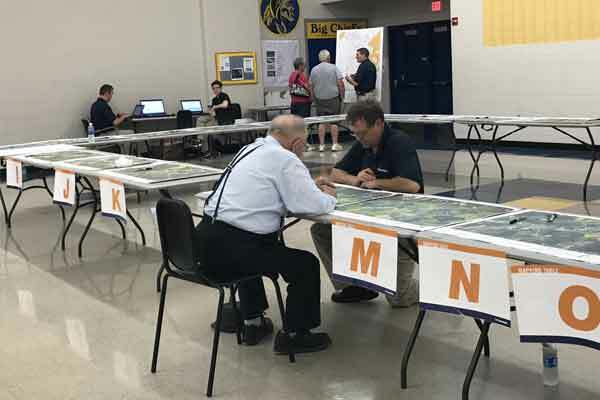 The Public Utility Commission held local input hearings in Franklin and York Counties in the Summer and Fall of 2018 and evidentiary hearings in February 2019. Electric and magnetic fields (EMF) occur in nature and wherever electricity flows. Electric and magnetic fields are present in and around the earth. Thunderstorms produce EMF. The earth’s magnetic field is the force that causes a compass to always point north. Magnetic fields also result from current or the flow of electricity in a wire; field strength increases as the current increases and decreases as distance from the wire increases. Magnetic fields are measured in units called gauss or Tesla and typically are reported in thousandths of a gauss, milligauss (mG), or microTelsa. Electric fields are produced by the presence of voltage or an electrical charge: the higher the voltage, the greater the electric field. Electric fields are measured in volts per meter. A lamp that is plugged in produces an electric field even while it is turned off. It will produce a magnetic field only when it is turned on. Objects such as trees, shrubs and buildings can block electric fields. Magnetic fields, however, are not easily blocked and can pass through most objects. The strength of both fields declines rapidly as the distance from the wire increases. Because EMF can be found in nature and because our society relies on electricity, people are exposed to EMF much of the time. Electric and magnetic fields are everywhere. Virtually all human beings in industrialized countries are exposed to them most of the time. Electric and magnetic fields are produced by household wiring and appliances, as well as by all other electric equipment. Electric and magnetic fields are created by electric lines needed to power our society. Transource is obligated to meet its customers’ needs by providing service that is reliable and economical and as safe as possible. We must design and operate our electric system in a manner consistent with all these obligations. Transourcee and its parent companies have followed worldwide scientific study and developments related to EMF for decades. They have participated in EMF research through membership in trade associations and have communicated with customers and employees on the issue. Scientific studies over the past several decades have explored the possibility of health effects from EMF. While some of the studies have indicated some statistical associations between EMF and certain health effects, the majority of research has found no such association. Significantly, laboratory research has not shown any causal relationship between EMF exposure and cancer, or any other adverse health effects. 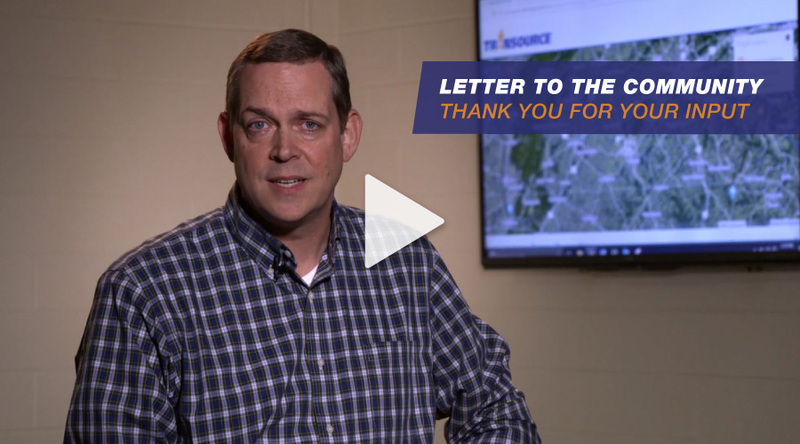 Because the issue involves questions of public and employee health, Transource remains committed to participating in the EMF issue on a national and worldwide level and to serving as a resource to customers and employees regarding the EMF issue. 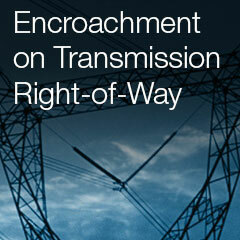 For general information about EMF – what they are, what causes them, whether they can be blocked or mitigated, etc. – please consult our answers to the following frequently asked questions. Commonly called EMF, electric and magnetic fields are invisible lines of force present in the natural environment and wherever electricity flows. Sources of EMF include electric power lines, electrical wiring in homes and businesses, home appliances, office equipment, electric tools and hospital diagnostic equipment. Electric fields are produced by voltage or electric charge. These types of fields are measured in volts per meter(V/m). The higher the voltage, the greater the electric field. A lamp cord that is plugged in produces an electric field even if the lamp is not on. Magnetic fields are created by the current or flow of electricity in a wire. As current increases, the field strength increases. 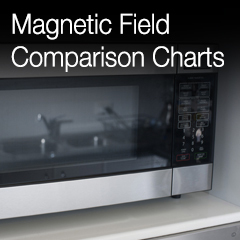 When an appliance is turned on, the magnetic field is produced. The magnetic field is not present when the appliance is turned off. Magnetic fields are measured in units called gauss or Tesla and typically are reported in milligauss or mircroTesla. Note: 1 guass = 1,000 milligauss (mG); 1mG= 0.1 mircroTesla. How does nature produce EMF? Electric and magnetic fields are present in and around the earth, which has a magnetic field strong enough to make a compass needle point north. This field averages approximately 500 mG at the earth's surface and is relatively static. Unlike alternating current (AC) magnetic fields associated with power lines, static or direct current (DC) fields do not cause electrical charges to flow in stationary objects. Thunderstorm activity in the atmosphere is a source of naturally-occurring EMF. How does power frequency EMF (EMF associated with power lines and household appliances) compare with other sources of electromagnetic energy? The electromagnetic spectrum covers a wide range of frequencies. These frequencies are expressed in hertz (Hz) or cycles per second. Electrical current associated with power lines and household appliances is characterized by extremely low frequencies -- 60 Hz AC, meaning the direction of current alternates at a rate of 60 times per second. Energy associated with x-rays, for example, is at the higher end of the electromagnetic spectrum. Scientists generally agree that 60 Hz fields are not powerful enough to damage the body's genetic material or to directly cause cancer. This chart illustrates some common sources of electromagnetic energy. Is it possible to block EMF? 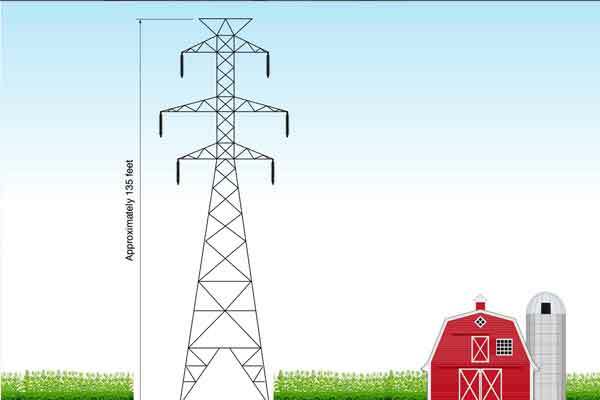 Electric fields are blocked by trees, shrubs, building materials and other objects. Magnetic fields, on the other hand, are not easily blocked and can pass through most objects. The strength of both electric and magnetic fields declines rapidly with distance from the source. Note: the asterisk (*) indicates same as background fields. How does EMF exposure vary throughout the day? A person is routinely exposed to EMF from a large number of sources throughout the day. Electric and magnetic field exposure depends to a large degree on what a person is doing. The chart illustrates how a person's exposure to EMF may fluctuate during a 24-hour period. It is important to note that no level of electric or magnetic field has been determined to be hazardous. While asleep, this person's magnetic field exposure was less than 1 mG. During the day, exposure varied to a peak of about 20 mG. Average magnetic field exposure during this 24-hour period was 0.5 mG.
What type of EMF research is being done? Laboratory or basic science studies which look at effects of EMF on cells and tissue samples of humans and animals. Epidemiological studies which use statistics to determine whether an association exists between a disease and an environmental factor such as EMF exposure. Exposure assessment studies which look at the sources and amount of EMF exposure. Scientific studies over the past several decades have explored the possibility of health effects from EMF exposure. While some of the studies have indicated some statistical associations between EMF and certain health effects, the majority of research has found no such association. Significantly, laboratory research has not shown any causal relationship between EMF exposure and cancer, or any other adverse heath effects. Transource’s parent companies have been involved in the EMF issue by following worldwide scientific developments, participating in EMF research, sponsoring studies and communicating with customers and employees on the issue. Transource’s parent companies also are members of the Electric Power Research Institute, which sponsors and coordinates EMF laboratory, epidemiological and exposure studies. 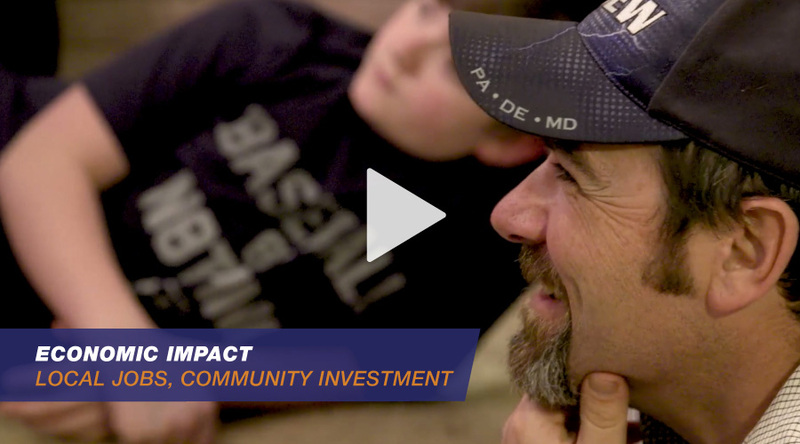 In addition to monitoring and sponsoring research, Transource shares the results of these programs with customers and employees. Transource’s overall responsibility is to continue providing safe and reliable electric service and a safe working environment for employees. Can EMF measurements be taken in my home? Upon request, an Transource representative will conduct EMF measurements at your home. However, the representative will not be able to interpret whether the field levels are safe or hazardous because no level of exposure has been determined to be unsafe. 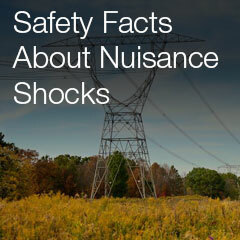 We all are aware of certain safety issues associated with electricity, such as electric shock. But some scientists also have raised questions about potential health effects caused by exposure to electric and magnetic fields (EMF). Researchers are trying to determine whether EMF can lead to cancer, particularly childhood leukemia or brain cancer. So far, studies have been inconclusive or have failed to link EMF to cancer. Questions about health effects from EMF exposure first arose in the 1960s and 1970s with the use of higher transmission voltages in the U.S. Early research focused on electric fields. Studies of electric fields overall have found no evidence of biological changes that could lead to health effects. 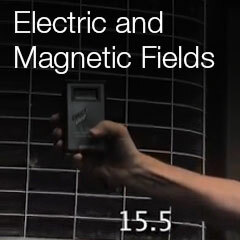 The research focus moved to magnetic fields when, in 1979, an epidemiological study suggested that magnetic fields might be linked to childhood cancers. Since then, while some statistical associations have been reported, no actual health effects have been demonstrated. Transource and its parent companies are not health research experts and recommend that interested individuals review the expert information available at the links provided below. By providing these links, Transource is not endorsing the accuracy or quality of information, nor does it necessarily agree with any conclusions set forth by these sources. Transource takes any health and safety issue very seriously. Therefore, the company monitors scientific and technical developments and public policy related to EMF as part of its ongoing effort to provide a safe environment. Transource itself does not actively conduct research on the health effects of EMF. However, through its membership in the Electric Power Research Institute (EPRI – the research organization for the electric utility industry), Transource’s parent company has sponsored and continues to sponsor research. Transource’s parent company was among sponsors of the U.S. Department of Energy’s $45 million EMF Research and Public Information Dissemination (RAPID) Program. Upon request, Transource will conduct measurements of EMF. However, interpretation of such measurements is impossible because no level of exposure has been determined to be unsafe. You can obtain additional information about electric and magnetic fields at numerous websites. By providing the links below, Transource is not endorsing the accuracy or quality of nor does it necessarily agree with any conclusions set forth by these sources. Please see Health effects of EMF for links to current reports on that specific topic. 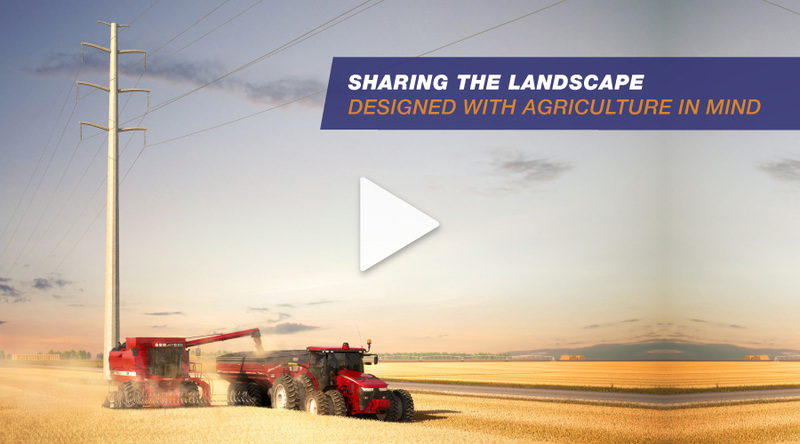 Thank you for visiting the virtual open house for the Independence Energy Connection Project. 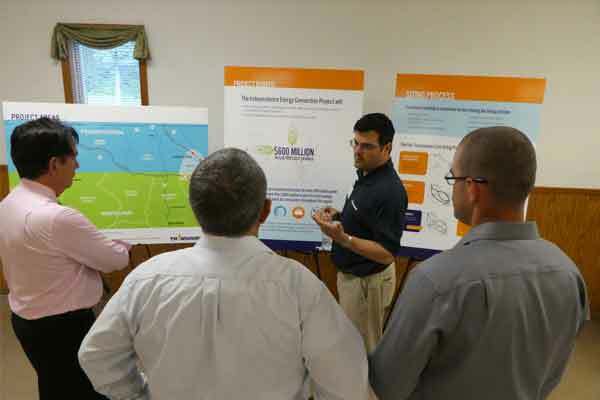 In June, Transource hosted six open houses in Pennsylvania and Maryland to discuss the project and gather community input on study segments. 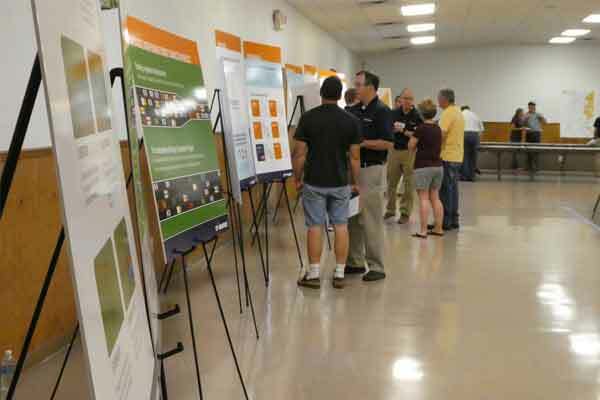 Below are the poster boards reviewed at the open houses.